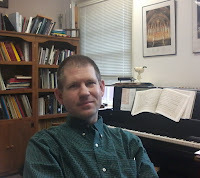 I’m a musicologist by training (Ph.D. from Cornell, 2005); musicology is where my heart is, but I end up doing all sorts of other musical things, whether or not I really should--playing horn in sections where I am the weakest player by a wide margin, playing the organ in situations where I should have practiced more, accompanying students in repertoire that is beyond my pianistic abilities. I arrange and compose, but really just for the fun of it. Most of my time is taken by my day job, administering the music department at the University of Mary Washington (Fredericksburg, VA). The themes of this blog have been rattling around in my head for several years. I finally realized it was a book that I would never feel ready to write (and would be out of date before publication anyway), and that a blog would be a good way to explore these issues. For the first year I limited myself to two posts a month (an attempt to not let it run away with my time); even though the list of topics I want to discuss seems as long now as it did when I started, I changed jobs in the summer of 2017, and I decided that I would have to lift my self-imposed posting deadlines, as settling my family in my new location is a more important use of my “free” time. Starting in summer 2018 I am now aiming to post on the first of each month. I find myself thinking about musical text all the time anyway, particularly when I am accompanying. I regularly review editions of music in the Music Library Association journal Notes. Otherwise most of my publications have involved my work on British music c. 1860s-1960s. Among these are critical editions of music by William Walton (orchestral works c. 1960 and suites derived from his film scores), and a further volume of orchestral song cycles by Charles Villiers Stanford. Another major focus of my research has been the music of Arthur Sullivan. Textual issues abound at every turn. Indeed, it is the new wave of textual scholarship involving the Savoy operas (for example, this and this) that will revolutionize the scholarly understanding of those works. It is an exciting time to work on Gilbert & Sullivan. I have just started a project with a student preparing an edition of John Philip Sousa’s 1879 orchestration HMS Pinafore, reconstructing it from a fragmentary score (about 1/3 is extant) in the Library of Congress, and from parts preserved in Sydney, Australia. As is clear from the images below, the parts got plenty of use over the decades. Pronouns: he/him/his. My last name is pronounced as if the "y" were an "r": KIRK-in-dahl. Original commentary © 2016–2019 James Brooks Kuykendall. Simple theme. Powered by Blogger.